So many Apparatus and Materials are required in Physical Science Laboratory. Here we gives you a list of apparatus, material required for Physical Science Laboratory. These apparatus and materials are very useful for the students who are studying 10th Class for the subject Physical Science. 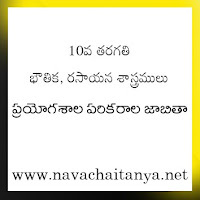 10th Class Physical Science lab record | 10th Class Lab Apparatus list | 10th Class Lab material list | list of Lab apparatus, material for Science Laboratory. 10th Class Physical Science EXPERIMENTS . . .